President Obama put on his “man of the people” face today when he said he won’t leave on his Christmas vacation to Hawaii until “my friends in the Senate have completed their work. My attitude is if they are making these sacrifices to provide health care to all Americans, the least I can do is be around and provide them any encouragement and last-minute help”. What an incredible act of self-sacrifice, what an incredible political act! This President has no balls, he’s a weakling who can only stand up to conservative radio and television commentators making threats and sounding tough. But when it comes to rogue nations and their tin-pot dictators, like North Korea, Iran, Syria, and China, Obama can only genuflect, preach engagement talks with no pre-conditions and then fold like a cheap deck chair. 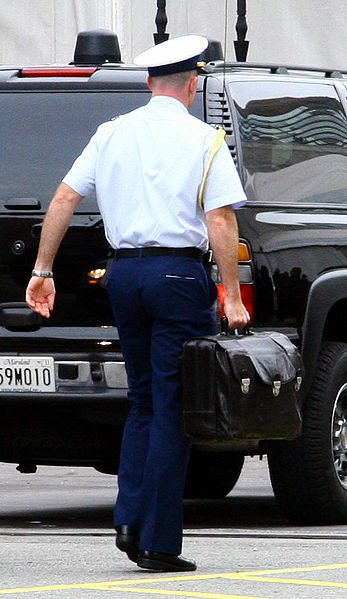 When ever the President travels outside the White House a military aide carries a Zero Halliburton briefcase inside a black leather “jacket” called the “Atomic Football”. This nuclear football contains the launch codes to authorize a nuclear attack — but instead, I think it carries a set of brass balls that this president sorrowley needs. On inauguration day, President Obama said he would sit down and talk with Iran and the other “axis of evil” nations to begin a new era of engagement and change the way the U.S. is perceived by the world. Iran, South Korea, Syria and China have all called his bluff and laughed at his naivite. Nothing has been accomplished and both Iran and North Korea continue to be security threats, even ramping up their sabre rattling. This is the same president who preaches the end of nuclear weapons and “smart diplomacy” with no tangible results after nearly a year in office. Obama has traveled the world and spouted a lot of his campaign boiler plate of hope and change and a new vision, blah, blah, blah, and blah. I’m really tired of this empty suit of a leader, with no idea of how to run the country, the economy or our security. The Rasmussen Reports daily Presidential Tracking Poll shows that 25% of the nation’s voters Strongly Approve of the way that Barack Obama is performing his role as President. 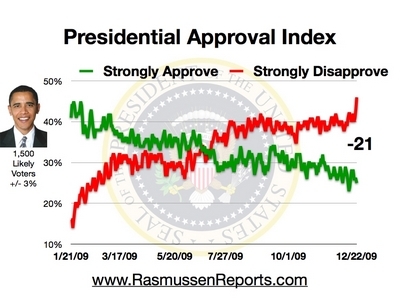 Forty-six percent (46%) Strongly Disapprove giving Obama a Presidential Approval Index rating of -21. That’s the lowest Approval Index rating yet recorded for this President. Meanwhile the super rush in the Senate by the Democrats to get passage of their version of the health care bill before Christmas is a complete sham. The Senate will not convene until January 19th, 2010 and once the healthcare bill becomes law it will not be providing the citizens anything until 2014. UPDATE: 12/24/09 This President really sickens me as he continues to disgrace the role of Commander-in-Chief. Below is a photograph of Obama as he boarded Air Force One for his family vacation in Hawaii. 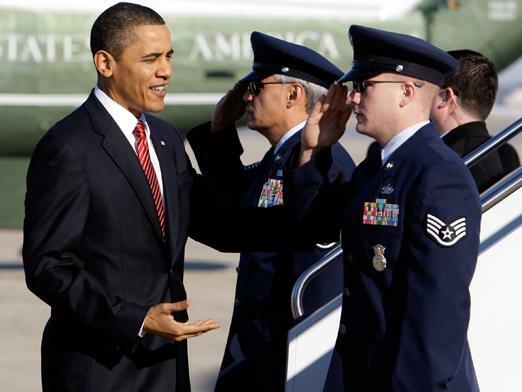 The Air Force Officers salute their Commander and instead of responding with a salute, jug-ears attempts to shake their hands — a total break down of Presidential protocol from this idiot community organizer. He is a complete failure. Come to think of it President Obama is not the only one without balls, the list includes Harry Reid and all the Democrats and Republicans, exclusive of Nancy Pelosi and Hillary Clinton who’ve managed to keep theirs.